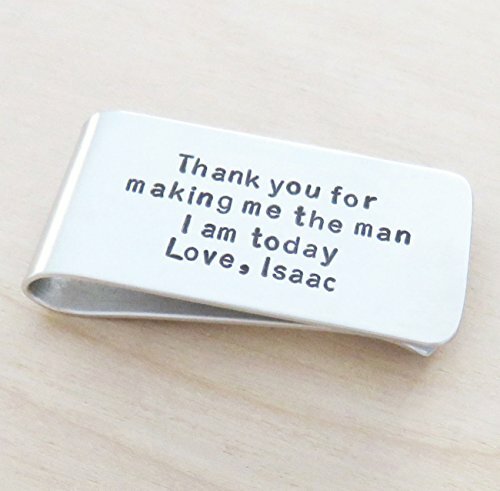 One (1) personalized light-weight aluminum money clip with the phrase “Thank you for making me the man I am today”, the word “Love,” and followed by a name. It measures about 2 3/8″ x 1 1/4″. The letters/symbols are etched into the metal by striking a hammer on steel stamps to leave a permanent indentation. While similar to engraving, metal stamping leaves a much deeper groove, which is then filled in with Sharpie’s “Super Permanent Ink” (See CARE INSTRUCTIONS below before ordering). Each piece is completely hand-stamped one letter at a time, so the words may not line up 100% straight, which is part of the uniqueness of handmade items. To order: provide the date to be stamped. Buyer is responsible for providing accurate customization information.